Big Earthquake near Cushing, Oklahome | America loves Sporks! People have publicly been warning this could happen. A few years ago, I wrote up some information about Cushing. Cushing is something of a historic artifact. Oil futures contracts in the United States are based on the assumption that oil demand can be measured by how much oil is in tank farms in Cushing. Cushing originally was a stopping point for Texas crude heading North to Chicago, East to Tulsa and North to Canada. The growth in Canadian tar sands oil and fracking in the upper Midwest totally changed everything. Now the oil needs to flow South to Houston for refining or export. The oil glut has had all of the tanks in Cushing 100% full, with plans to keep building more and more because of a pricing quirk called Contango. If the price people are willing to pay in the future is more than they’ll pay today, you make a guaranteed profit by buying oil today and delivering the oil in the future IF (huge IF) you can find a place to store the oil for a few months. The tanks in Cushing are ideal for this. This entry was posted in Collapse of America, Energy Supply. Bookmark the permalink. 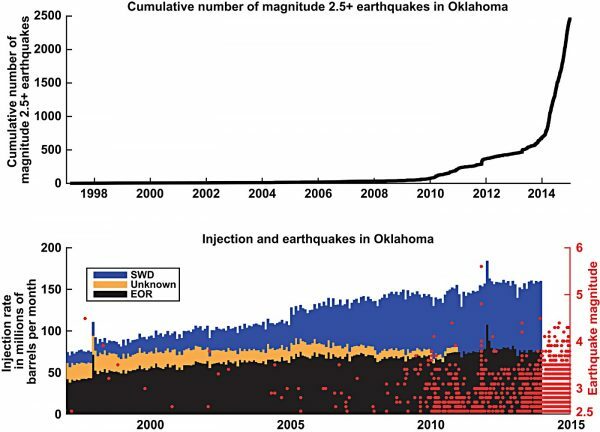 In the graph, SWD refers to Salt Water Disposal – oil and gas in Oklahoma is found in sedimentary layers that contain salt water. Each barrel of oil comes along with 15-20 barrels of salt water, which also contains metals. The water cannot be drained into streams and rivers, and must not contaminate the groundwater supply. EOR stands for Enhanced Oil Recovery – where salt water (or carbon dioxide) is injected from wells on the perimeter of the oil field to apply pressure to push the oil toward the extraction well. It is common for the salt water to be reinjected back into the same reservoir where the oil is located. Note the deceptive nature of the top graph – it is a hockey stick graph showing the cumulative number of quakes, not the rate per time interval. The sensitivity of seismometers is related to the bandwidth, which is limited by the period of the pendulum. Oil and gas use a very high bandwidth that detects movement at short distance, where small bandwidth filter out the noise and create very accurate movements triggered very far away. The graph more than likely reflects more seismographs optimized to detect small quakes at short distances. Yeah I saw Pics. The town got hammered. Hate that. wonder what is causing this? New active fault-line discovered? Is the fracking fluid lubricating the fault to allow this moving of plates? seems like they would need lots of fluid. I don’t know how much the inject, but I thought they injected it deep ? That’s killer, they don’t build their building to earthquake standards like San Fran.